Liczba stron: 838 Jest to ujednolicona liczba stron, która ułatwi Ci porównanie długości książek. Każda strona Legimi to 200 słów. 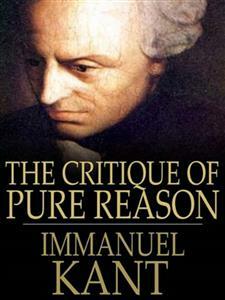 The Critique of Pure Reason by Immanuel Kant, first published in 1781, second edition 1787, is one of the most influential works in the history of philosophy. Also referred to as Kant's "first critique," it was followed in 1788 by the Critique of Practical Reason and in 1790 by the Critique of Judgment. In the preface to the first edition Kant explains what he means by a critique of pure reason: "I do not mean by this a critique of books and systems, but of the faculty of reason in general, in respect of all knowledge after which it may strive independently of all experience." Human reason, in one sphere of its cognition, is called upon toconsider questions,which it cannot decline, as they are presentedby its own nature, but which it cannot answer, as they transcendevery faculty of the mind. It falls into this difficulty without any fault of its own. Itbegins with principles, which cannot be dispensed within the fieldof experience, and the truth and sufficiency of which are, at thesame time, insured by experience. With these principles it rises,in obedience to the laws of its own nature, to ever higher and moreremote conditions. But it quickly discovers that, in this way, itslabours must remain ever incomplete, because new questions nevercease to present themselves; and thus it finds itself compelled tohave recourse to principles which transcend the region ofexperience, while they are regarded by common sense withoutdistrust. It thus falls into confusion and contradictions, fromwhich it conjectures the presence of latent errors, which, however,it is unable to discover, because the principles it employs,transcending the limits of experience, cannot be tested by thatcriterion. The arena of these endless contests is calledMetaphysic. At first, her government, under the administration of thedogmatists, was an absolute despotism. But, as the legislativecontinued to show traces of the ancient barbaric rule, her empiregradually broke up, and intestine wars introduced the reign ofanarchy; while the sceptics, like nomadic tribes, who hate apermanent habitation and settled mode of living, attacked from timeto time those who had organized themselves into civil communities.But their number was, very happily, small; and thus they could notentirely put a stop to the exertions of those who persisted inraising new edifices, although on no settled or uniform plan. Inrecent times the hope dawned upon us of seeing those disputessettled, and the legitimacy of her claims established by a kind ofphysiology of the human understanding—that of the celebratedLocke. But it was found that—although it was affirmed thatthis so-called queen could not refer her descent to any highersource than that of common experience, a circumstance whichnecessarily brought suspicion on her claims—as this genealogywas incorrect, she persisted in the advancement of her claims tosovereignty. Thus metaphysics necessarily fell back into theantiquated and rotten constitution of dogmatism, and again becameobnoxious to the contempt from which efforts had been made to saveit. At present, as all methods, according to the generalpersuasion, have been tried in vain, there reigns nought butweariness and complete indifferentism—the mother of chaos andnight in the scientific world, but at the same time the source of,or at least theprelude to, the re-creation and reinstallation of ascience, when it has fallen into confusion, obscurity, and disusefrom ill directed effort. For it is in reality vain to profess indifference in regard tosuch inquiries, the object of which cannot be indifferent tohumanity. Besides, these pretended indifferentists, however muchthey may try to disguise themselves by the assumption of a popularstyle and by changes onthe language of the schools, unavoidablyfall into metaphysical declarations and propositions, which theyprofess to regard with so much contempt. At the same time, thisindifference, which has arisen in the world of science, and whichrelates to that kind of knowledge which we should wish to seedestroyed the last, is a phenomenon that well deserves ourattention and reflection. It is plainly not the effect of thelevity, but of the matured judgement* of the age, which refuses tobe any longer entertainedwith illusory knowledge, It is, in fact, acall to reason, again to undertake the most laborious of alltasks—that of self-examination, and to establish a tribunal,which may secure it in its well-grounded claims, while itpronounces against all baselessassumptions and pretensions, not inan arbitrary manner, but according to its own eternal andunchangeable laws. This tribunal is nothing less than the criticalinvestigation of pure reason. I do not mean by this a criticism of books and systems, but acritical inquiry into the faculty of reason, with reference to thecognitions to which it strives to attain without the aid ofexperience; in other words, the solution of the question regardingthe possibility or impossibility of metaphysics,and thedetermination of the origin, as well as of the extent and limits ofthis science. All this must be done on the basis of principles. This path—the only one now remaining—has beenentered upon by me; and I flatter myself that I have, in this way,discovered the cause of—and consequently the mode ofremoving—all the errors which have hitherto set reason atvariance with itself, in the sphere of non-empirical thought. Ihave not returned an evasive answer to the questions of reason, byalleging the inability and limitation of the faculties of the mind;I have, on the contrary, examined them completely in the light ofprinciples, and, after having discovered the cause of the doubtsand contradictions into which reason fell, have solved them to itsperfect satisfaction. It is true, these questions have not beensolved as dogmatism, in its vain fancies and desires, had expected;for it can only be satisfied by the exercise of magical arts, andof these I have no knowledge. But neither do these come within thecompass of our mental powers; and it was the duty of philosophy todestroy the illusions which hadtheir origin in misconceptions,whatever darling hopes and valued expectations may be ruined by itsexplanations. My chief aim in this work has been thoroughness; andI make bold to say that there is not a single metaphysical problemthat does not find its solution, or at least the key to itssolution, here. Pure reason is a perfect unity; and therefore, ifthe principle presented by it prove to be insufficient for thesolution of even a single one of those questions to which the verynature of reason gives birth, we must reject it, as we could not beperfectly certain of its sufficiency in the case of the others. While I say this, I think I see upon the countenance of thereader signs of dissatisfaction mingled with contempt, when hehears declarations which sound so boastful and extravagant; and yetthey are beyond comparison more moderate than those advanced by thecommonest author of the commonest philosophical programme, in whichthe dogmatist professes to demonstrate the simple nature of thesoul, or the necessity of a primal being. Such a dogmatist promisesto extend human knowledge beyond the limits of possible experience;while I humbly confess that this is completely beyond my power.Instead of any such attempt, I confine myself to the examination ofreason alone and its pure thought; and I do not need to seek farfor the sum-total of its cognition, because it has its seat in myown mind. Besides, common logic presents me with a complete andsystematic catalogue of all the simple operations of reason; and itis my task to answer the question how far reason can go, withoutthe material presented and the aid furnished by experience. So much for the completeness and thoroughness necessary in theexecution of the present task. The aims set before us are notarbitrarily proposed, but are imposed upon us by the nature ofcognition itself. The above remarks relate to the matter of our critical inquiry.As regards the form, there are two indispensable conditions, whichany one who undertakes so difficult a task as that of a critique ofpure reason, is bound to fulfil. These conditions are certitude andclearness. As regards certitude, I have fully convinced myself that, inthis sphere of thought, opinion is perfectly inadmissible, and thateverything which bears the least semblance of an hypothesis must beexcluded, as of no value in such discussions. For it is a necessarycondition of every cognition that is tobe established upon a priorigrounds that it shall be held to be absolutely necessary; much moreis this the case with an attempt to determine all pure a prioricognition, and to furnish the standard—and consequently anexample—of all apodeictic (philosophical) certitude. WhetherI have succeeded in what I professed to do, it is for the reader todetermine; it is the author's business merely to adduce grounds andreasons, without determining what influence these ought to have onthe mind of his judges. But,lest anything he may have said maybecome the innocent cause of doubt in their minds, or tend toweaken the effect which his arguments might otherwiseproduce—he may be allowed to point out those passages whichmay occasion mistrust or difficulty, although these do not concernthe main purpose of the present work. He does this solely with theview of removing from the mind of the reader any doubts which mightaffect his judgement of the work as a whole, and in regard to itsultimate aim. I know no investigations more necessary for a full insight intothe nature of the faculty which we call understanding, and at thesame time for the determination of the rules and limits of its use,than those undertaken in the second chapter of the"TranscendentalAnalytic," under the title of "Deduction of the PureConceptions of the Understanding"; and they have also cost me byfar the greatest labour—labour which, I hope, will not remainuncompensated. The view there taken, which goes somewhat deeplyinto the subject, hastwo sides, The one relates to the objects ofthe pure understanding, and is intended to demonstrate and torender comprehensible the objective validity of its a prioriconceptions; and it forms for this reason an essential part of theCritique. The otherconsiders the pure understanding itself, itspossibility and its powers of cognition—that is, from asubjective point of view; and, although this exposition is of greatimportance, it does not belong essentially to the main purpose ofthe work, because thegrand question is what and how much can reasonand understanding, apart from experience, cognize, and not, how isthe faculty of thought itself possible? As the latter is an inquiryinto the cause of a given effect, and has thus in it some semblanceof anhypothesis (although, as I shall show on another occasion,this is really not the fact), it would seem that, in the presentinstance, I had allowed myself to enounce a mere opinion, and thatthe reader must therefore be at liberty to hold a differentopinion. But I beg to remind him that, if my subjective deductiondoes not produce in his mind the conviction of its certitude atwhich I aimed, the objective deduction, with which alone thepresent work is properly concerned, is in every respectsatisfactory. As regards clearness, the reader has a right to demand, in thefirst place, discursive or logical clearness, that is, on the basisof conceptions, and, secondly, intuitive or aesthetic clearness, bymeans of intuitions, that is, by examples or other modesofillustration in concreto. I have done what I could for the firstkind of intelligibility. This was essential to my purpose; and itthus became the accidental cause of my inability to do completejustice to the second requirement. I have been almost always at aloss, during the progress of this work, how to settle thisquestion. Examples and illustrations always appeared to menecessary, and, in the first sketch of the Critique, naturally fellinto their proper places. But I very soon became aware ofthemagnitude of my task, and the numerous problems with which Ishould be engaged; and, as I perceived that this criticalinvestigation would, even if delivered in the driest scholasticmanner, be far from being brief, I found it unadvisable to enlargeit still more with examples and explanations, which are necessaryonly from a popular point of view. I was induced to take thiscourse from the consideration also that the present work is notintended for popular use, that those devoted to science do notrequire such helps, although they are always acceptable, and thatthey would have materially interfered with my present purpose. AbbeTerrasson remarks with great justice that, if we estimate the sizeof a work, not from the number of its pages, but from the timewhich we require to make ourselves master of it, it may be said ofmany a book that it would be much shorter, if it were not so short.On the other hand, as regards the comprehensibility of a system ofspeculative cognition, connected under a single principle, we maysay with equal justice: many a book would have been much clearer,if it had not been intended to be so very clear. For explanationsand examples, and other helps to intelligibility, aid us in thecomprehension of parts, but they distract theattention, dissipatethe mental power of the reader, and stand in the way of his forminga clear conception of the whole; as he cannot attain soon enough toa survey of the system, and the colouring andembellishmentsbestowed upon it prevent his observingitsarticulation or organization—which is the most importantconsideration with him, when he comes to judge of its unity andstability. The reader must naturally have a strong inducement to co-operatewith the present author, if he has formed the intention of erectinga complete and solid edifice of metaphysical science, according tothe plan now laid before him. Metaphysics, as here represented, isthe only science which admits of completion—and with littlelabour, if it is united, in a short time; so that nothing will beleft to future generations except the task of illustrating andapplying it didactically. For this science is nothing more than theinventory of all that is given us by pure reason, systematicallyarranged. Nothing can escape our notice; for what reason producesfrom itself cannot lie concealed, but must be brought to the lightby reason itself, so soon as we have discovered the commonprinciple of the ideas we seek. The perfect unity of this kind ofcognitions, which are based upon pure conceptions, and uninfluencedby any empirical element, or any peculiar intuition leading todeterminate experience, renders this completeness not onlypracticable, but also necessary. Tecum habita, et noris quam sit tibi curtasupellex. —Persius.Satirae iv. 52. Such a system of pure speculative reason I hope to be able topublish under the title of Metaphysic of Nature*. The content ofthis work (which will not be half so long) will be very much richerthan that of the present Critique, which hasto discover the sourcesof this cognition and expose the conditions of its possibility, andat the same time to clear and level a fit foundation for thescientific edifice. In the present work, I look for the patienthearing and the impartiality of a judge; in the other, for thegood-will and assistance of a co-labourer. For, however completethe list of principles for this system may be in the Critique, thecorrectness of the system requires that no deduced conceptionsshould be absent. These cannot be presented a priori, but must begradually discovered; and, while the synthesis of conceptions hasbeen fully exhausted in the Critique, it is necessary that, in theproposed work, the same should be the case with their analysis. Butthis will be rather an amusement than a labour. Whether the treatment of that portion of our knowledge whichlies within the province of pure reason advances with thatundeviating certainty which characterizes the progress of science,we shall be at no loss to determine. If we find those who areengaged in metaphysical pursuits, unable to come to anunderstanding as to the method which theyought to follow; if wefind them, after the most elaborate preparations, invariablybrought to a stand before the goal is reached, and compelled toretrace their steps and strike into fresh paths, we may then feelquite sure that they are far from having attained to the certaintyof scientific progress and may rather be said to be merely gropingabout in the dark. In these circumstances we shall render animportant service to reason if we succeed in simply indicating thepath along which it must travel, inorder to arrive at anyresults—even if it should be found necessary to abandon manyof those aims which, without reflection, have been proposed for itsattainment. That logic has advanced in this sure course, even from theearliest times, is apparent fromthe fact that, since Aristotle, ithas been unable to advance a step and, thus, to all appearance hasreached its completion. For, if some of the moderns have thought toenlarge its domain by introducing psychological discussions on themental faculties, such as imagination and wit, metaphysical,discussions on the origin of knowledge and the different kinds ofcertitude, according to the difference of the objects (idealism,scepticism, and so on), or anthropological discussions onprejudices, their causesand remedies: this attempt, on the part ofthese authors, only shows their ignorance of the peculiar nature oflogical science. We do not enlarge but disfigure the sciences whenwe lose sight of their respective limits and allow them to run intoone another. Now logic is enclosed within limits which admit ofperfectly clear definition; it is a science which has for itsobject nothing but the exposition and proof of the formal laws ofall thought, whether it be a priori or empirical, whatever be itsorigin or its object, and whatever the difficulties—naturalor accidental—which it encounters in the human mind. The early success of logic must be attributed exclusively to thenarrowness of its field, in which abstraction may, or rather must,be made of all theobjects of cognition with their characteristicdistinctions, and in which the understanding has only to deal withitself and with its own forms. It is, obviously, a much moredifficult task for reason to strike into the sure path of science,where it has to deal not simply with itself, but with objectsexternal to itself. Hence, logic is properly only apropaedeutic—forms, as it were, the vestibule of thesciences; and while it is necessary to enable us to form a correctjudgement with regard to the variousbranches of knowledge, stillthe acquisition of real, substantive knowledge is to be sought onlyin the sciences properly so called, that is, in the objectivesciences. Now these sciences, if they can be termed rational at all, mustcontain elements of apriori cognition, and this cognition may standin a twofold relation to its object. Either it may have todetermine the conception of the object—which must be suppliedextraneously, or it may have to establish its reality. The formeris theoretical, the latter practical, rational cognition. In both,the pure or a priori element must be treated first, and must becarefullydistinguished from that which is supplied from othersources. Any other method can only lead to irremediableconfusion. Mathematics and physics are the two theoretical sciences whichhave to determine their objects a priori. The former is purely apriori, the latter is partially so, but is also dependent on othersources of cognition. In the earliest times of which history affords us any record,mathematics had already entered on the sure course of science,among that wonderful nation, the Greeks. Still it is not to besupposed that it was as easy for this science to strike into, orrather to construct for itself, that royal road, as it wasforlogic, in which reason has only to deal with itself. On thecontrary, I believe that it must have remained long—chieflyamong the Egyptians—in the stage of blind groping after itstrue aims and destination, and that it was revolutionized by thehappy idea of one man, who struck out and determined for all timethe path which this science must follow, and which admits of anindefinite advancement. The history of this intellectualrevolution—much more important in its results than thediscovery of the passage round the celebrated Cape of GoodHope—and of its author, has not been preserved. But DiogenesLaertius, in naming the supposed discoverer of some of the simplestelements of geometrical demonstration—elements which,according to the ordinary opinion,do not even require to beproved—makes it apparent that the change introduced by thefirst indication of this new path, must have seemed of the utmostimportance to the mathematicians of that age, and it has thus beensecured against the chance of oblivion. A new light must haveflashed on the mind of the first man (Thales, or whatever may havebeen his name) who demonstrated the properties of the isoscelestriangle. For he found that it was not sufficient to meditate onthe figure, as it lay before his eyes, or the conception of it, asit existed in his mind, and thus endeavour to get at the knowledgeof its properties, but that it was necessary to produce theseproperties, as it were, by a positive a priori construction; andthat, in order to arrive with certainty at a priori cognition, hemust not attribute to the object any other properties than thosewhich necessarily followed from that which he had himself, inaccordance with his conception, placed in the object. A much longer period elapsed before physics entered on thehighway of science. For it is only about a century and a half sincethe wise Bacon gave a new direction to physical studies, orrather—as others were already on the righttrack—imparted fresh vigour to the pursuit of this newdirection.Here, too, as in the case of mathematics, we findevidence of a rapid intellectual revolution. In the remarks whichfollow I shall confine myself to the empirical side of naturalscience. When Galilei experimented with balls of a definite weight on theinclined plane, when Torricelli caused the air to sustain a weightwhich he had calculated beforehand to be equal to that of adefinite column of water, or when Stahl, at a later period,converted metals into lime, and reconverted lime into metal, by theaddition and subtraction of certain elements; [Footnote: I do nothere follow with exactness the history of the experimental method,of which, indeed, the first steps are involved in some obscurity. ]a light broke upon all natural philosophers. They learned thatreason only perceives that which it produces after its own design;that it must not be content to follow, as it were, in theleading-strings of nature, but must proceed in advance withprinciples of judgement according to unvarying laws, andcompelnature to reply its questions. For accidental observations, madeaccording to no preconceived plan, cannot be united under anecessary law. But it is this that reason seeks for and requires.It is only the principles of reason which can give to concordantphenomena the validity of laws, and it is only when experiment isdirected by these rational principles that it can have any realutility. Reason must approach nature with the view, indeed, ofreceiving information from it, not, however, in the character ofapupil, who listens to all that his master chooses to tell him, butin that of a judge, who compels the witnesses to reply to thosequestions which he himself thinks fit to propose. To this singleidea must the revolution be ascribed, by which, after groping inthe dark for so many centuries, natural science was at lengthconducted into the path of certain progress. We come now to metaphysics, a purely speculative science, whichoccupies a completely isolated position and is entirely independentof the teachings of experience. It deals with mereconceptions—not, like mathematics, with conceptions appliedto intuition—and in it, reason is the pupil of itself alone.It is the oldest of the sciences, and would still survive, even ifall the rest were swallowed up in the abyss of an all-destroyingbarbarism. But it has not yet had the good fortune to attain to thesure scientific method. This will be apparent; if we apply thetests which we proposed at the outset. We find that reasonperpetually comes to a stand,when it attempts to gain a priori theperception even of those laws which the most common experienceconfirms. We find it compelled to retrace its steps in innumerableinstances, and to abandon the path on which it had entered, becausethis does not lead to the desired result. We find, too, that thosewho are engaged in metaphysical pursuits are far from being able toagree among themselves, but that, on the contrary, this scienceappears to furnish an arena specially adapted for the display ofskill or theexercise of strength in mock-contests—a field inwhich no combatant ever yet succeeded in gaining an inch of ground,in which, at least, no victory was ever yet crowned with permanentpossession. This leads us to inquire why it is that, in metaphysics, thesure path of science has not hitherto been found. Shall we supposethat it is impossible to discover it? Why then should nature havevisited our reason with restless aspirations after it, as if itwere one of our weightiest concerns? Nay, more, how little causeshould we have to place confidence in our reason, if it abandons usin a matter about which, most of all, we desire to know thetruth—and not only so, but even allures us to the pursuit ofvain phantoms, only to betray us in the end? Or, if the path hasonly hitherto been missed, what indications do we possess to guideus in a renewed investigation, and to enable us to hope for greatersuccess than has fallen to the lot of our predecessors? But, it will be asked, what kind of a treasure is this that wepropose to bequeath to posterity? What is the real value of thissystem of metaphysics, purified bycriticism, and thereby reduced toa permanent condition? A cursory view of the present work will leadtothe supposition that its use is merely negative, that it onlyserves to warn us against venturing, with speculative reason,beyond the limits of experience. This is, in fact, its primary use.But this, at once, assumes a positive value, when we observe thatthe principles with which speculative reason endeavours totranscend its limits lead inevitably, not to the extension, but tothe contraction of theuse of reason, inasmuch as they threaten toextend the limits of sensibility, which is their proper sphere,over the entire realm of thought and, thus, to supplant the pure(practical) use of reason. So far, then, as this criticism isoccupied in confining speculative reason within its proper bounds,it is only negative; but, inasmuch as it thereby, at the same time,removes an obstacle which impedes and even threatens to destroy theuse of practical reason, it possesses a positive and very importantvalue. In order to admit this, we have only to be convinced thatthere is an absolutely necessary use of pure reason—the moraluse—in which it inevitably transcends the limits ofsensibility, without the aid of speculation, requiring only to beinsured againstthe effects of a speculation which would involve itin contradiction with itself. To deny the positive advantage of theservice which this criticism renders us would be as absurd as tomaintain that the system of police is productive of no positivebenefit, since its main business is to prevent the violence whichcitizen has to apprehend from citizen, that so each may pursue hisvocation in peace and security. That space and time are only formsof sensible intuition, and hence are only conditions of theexistence of things as phenomena; that, moreover, we have noconceptions of the understanding, and, consequently, no elementsfor the cognition of things, except in so far as a correspondingintuition can be given to these conceptions; that, accordingly, wecan have no cognition of an object, as a thing in itself, but onlyas an object of sensible intuition, that is, asphenomenon—all this is proved in the analytical part of theCritique; and from this the limitation of all possible speculativecognition to the mere objects of experience, follows as a necessaryresult. At the same time, it must be carefully borne in mind that,while we surrender the power of cognizing, we still reserve thepower of thinking objects, as things in themselves. * For,otherwise, weshould require to affirm the existence of anappearance, without something that appears—which would beabsurd. Now let us suppose, for a moment, that we had notundertaken this criticism and, accordingly, had not drawn thenecessary distinction between things as objects of experience andthings as they are in themselves. The principle of causality, and,by consequence, the mechanism of nature as determined by causality,would then have absolute validity in relation to all things asefficient causes. I should then be unable to assert, with regard toone and the same being, e.g., the human soul, that its will isfree, and yet, at the same time, subject to natural necessity, thatis, not free, without falling into a palpable contradiction, for inboth propositions I should take the soul in the same signification,as a thing in general, as a thing in itself—as, withoutprevious criticism, I could not but take it. Suppose now, on theother hand, that we have undertaken this criticism, and have learntthat an object may be taken in two senses, first, as a phenomenon,secondly, as a thing in itself; and that, according to thededuction of the conceptions of the understanding, the principle ofcausality has reference only to things in the first sense. We thensee howit does not involve any contradiction to assert, on the onehand, that the will, in the phenomenal sphere—in visibleaction—is necessarily obedient to the law of nature, and, inso far, not free; and, on the other hand, that, as belonging to athing in itself, it is not subject to that law, and, accordingly,is free. Now, it is true that Icannot, by means of speculativereason, and still less by empirical observation, cognize my soul asa thing in itself and consequently, cannot cognize liberty as theproperty of a being to which I ascribe effects in the world ofsense. For, to do so, I must cognize this being as existing, andyet not in time, which—since I cannot support my conceptionby any intuition—is impossible. At the same time, while Icannot cognize, I can quite well think freedom, that is to say, myrepresentation of it involves at least no contradiction, if we bearin mind the critical distinction of the two modes of representation(the sensible and the intellectual) and the consequent limitationof the conceptions of the pure understanding and of the principleswhich flow from them. Suppose now that morality necessarilypresupposed liberty, in the strictest sense, as a property of ourwill; suppose that reason contained certain practical,originalprinciples a priori, which were absolutely impossiblewithout this presupposition; and suppose, at the same time, thatspeculative reason had proved that liberty was incapable of beingthought at all. It would then follow that the moral presuppositionmustgive way to the speculative affirmation, the opposite of whichinvolves an obvious contradiction, and that liberty and, with it,morality must yield to the mechanism of nature; for the negation ofmorality involves no contradiction, except on the presupposition ofliberty. Now morality does not require the speculative cognition ofliberty; it is enough that I can think it, that its conceptioninvolves no contradiction, that it does not interfere with themechanism of nature. But even this requirement we could notsatisfy, if we had not learnt the twofold sense in which things maybe taken; and it is only in this way that the doctrine of moralityand the doctrine of nature are confined within their proper limits.For this result, then, we are indebted to a criticism which warnsus of our unavoidable ignorance with regard to things inthemselves, and establishes the necessary limitation of ourtheoretical cognition to mere phenomena. The positive value of the criticalprinciples of pure reason inrelation to the conception of God and of the simple nature of thesoul, admits of a similar exemplification; but on this point Ishall not dwell. I cannot even make the assumption—as thepractical interests of morality require—of God, freedom, andimmortality, if I do not deprive speculative reason of itspretensions to transcendent insight. For to arrive at these, itmust make use of principles which, in fact, extend only to theobjects of possible experience, and which cannotbe applied toobjects beyond this sphere without converting them intophenomena,and thus rendering the practical extension of pure reasonimpossible. I must, therefore, abolish knowledge, to make room forbelief. The dogmatism of metaphysics, that is, thepresumption thatit is possible to advance in metaphysics without previouscriticism, is the true source of the unbelief (always dogmatic)which militates against morality. Thus, while it may be no very difficult task to bequeath alegacy to posterity, inthe shape of a system of metaphysicsconstructed in accordance with the Critique of Pure Reason, stillthe value of such a bequest is not to be depreciated. It willrender an important service to reason, by substituting thecertainty of scientific methodfor that random groping after resultswithout the guidance of principles, which has hithertocharacterized the pursuit of metaphysical studies. It will renderan important service to the inquiring mind of youth, by leading thestudent to apply his powers to the cultivation of genuine science,instead of wasting them, as at present, on speculations which cannever lead to any result, or on the idle attempt to invent newideas and opinions. But, above all, it will confer an inestimablebenefit on morality andreligion, by showing that all the objectionsurged against them may be silenced for ever by the Socratic method,that is to say, by proving the ignorance of the objector. For, asthe world has never been, and, no doubt, never will be without asystem of metaphysics of one kind or another, it is the highest andweightiest concern of philosophy to render it powerless for harm,by closing up the sources of error. This important change in the field of the sciences, this loss ofits fancied possessions, to which speculative reason must submit,does not prove in any way detrimental to the general interests ofhumanity. The advantages which the world has derived from theteachings of pure reason are not at all impaired. The loss falls,in its whole extent, on themonopoly of the schools, but does not inthe slightest degree touch the interests of mankind. I appeal tothe most obstinate dogmatist, whether the proof of the continuedexistence of the soul after death, derived from the simplicity ofits substance; of the freedom of the will in opposition to thegeneral mechanism of nature, drawn from the subtle but impotentdistinction of subjective and objective practical necessity; or ofthe existence of God, deduced from the conception of an ensrealissimum—the contingency of the changeable, and thenecessity of a prime mover, has ever been able to pass beyond thelimits of the schools, to penetrate the public mind, or to exercisethe slightest influence on its convictions. It must be admittedthat this has not been the case and that, owing to the unfitness ofthe common understanding for such subtle speculations, it can neverbe expected to take place. On the contrary, it is plain that thehope of a future life arises from the feeling, which exists in thebreast of every man, that the temporal is inadequate to meet andsatisfy the demands of his nature. In like manner, it cannot bedoubted that the clear exhibition of duties in opposition to allthe claims of inclination, gives rise to the consciousness offreedom, andthat the glorious order, beauty, and providential care,everywhere displayed in nature, give rise to the belief in a wiseand great Author of the Universe. Such is the genesis of thesegeneral convictions of mankind, so far as they depend on rationalgrounds; and this public property not only remains undisturbed, butis even raised to greater importance, by the doctrine that theschools have no right to arrogate to themselves a more profoundinsight into a matter of general human concernment than that towhich the great mass of men, ever held by us in the highestestimation, can without difficulty attain, and that the schoolsshould, therefore, confine themselves to theelaboration of theseuniversally comprehensible and, from a moral point of view, amplysatisfactory proofs. The change, therefore, affects only thearrogant pretensions of the schools, which would gladly retain, intheir own exclusive possession, the key to the truths which theyimpart to the public. At the same time it does not deprive the speculative philosopherof his just title to be the sole depositor of a science whichbenefits the public without its knowledge—I mean, theCritique of Pure Reason. This can never become popular and, indeed,has no occasion to be so; for finespun arguments in favour ofuseful truths make just as little impression on the public mind asthe equally subtle objections brought against these truths. On theother hand, since both inevitably force themselves on every man whorises to the height of speculation, it becomes the manifest duty ofthe schools to enter upon a thorough investigation of the rights ofspeculative reason and, thus, to prevent the scandal whichmetaphysical controversies are sure, sooner or later, to cause evento the masses. It is only by criticism that metaphysicians (and, assuch, theologians too) can be saved from these controversies andfrom the consequent perversion of their doctrines. Criticism alonecan strike a blow at the root of materialism,fatalism, atheism,free-thinking, fanaticism, and superstition, which are universallyinjurious—as well as of idealism and scepticism, which aredangerous to the schools, but can scarcely pass over to the public.If governments think proper to interfere with the affairs of thelearned, it would be more consistent with a wise regard for theinterests of science, as well as for those of society, to favour acriticism of this kind, by which alone the labours of reason can beestablished on a firm basis, than to support the ridiculousdespotism of the schools, which raise a loud cry of danger to thepublic over the destruction of cobwebs, of which the public hasnever taken any notice, and the loss of which, therefore, it cannever feel. This critical science isnot opposed to the dogmatic procedure ofreason in pure cognition; for pure cognition must always bedogmatic, that is, must rest on strict demonstration from sureprinciples a priori—but to dogmatism, that is, to thepresumption that it is possible to make any progress with a purecognition, derived from (philosophical) conceptions, according tothe principles which reason has long been in the habit ofemploying—without first inquiring in what way and by whatright reason has come into the possession of these principles.Dogmatism is thus the dogmatic procedure of pure reason withoutprevious criticism of its own powers, and in opposing thisprocedure, we must not be supposed to lend any countenance to thatloquacious shallowness which arrogates to itselfthe name ofpopularity, nor yet to scepticism, which makes short work with thewhole science of metaphysics. On the contrary, our criticism is thenecessary preparation for a thoroughly scientific system ofmetaphysics which must perform its task entirelya priori, to thecomplete satisfaction of speculative reason, and must, therefore,be treated, not popularly, but scholastically. In carrying out theplan which the Critique prescribes, that is, in the future systemof metaphysics, we must have recourse tothe strict method of thecelebrated Wolf, the greatest of all dogmatic philosophers. He wasthe first to point out the necessity of establishing fixedprinciples, of clearly defining our conceptions, and of subjectingour demonstrations to the most severescrutiny, instead of rashlyjumping at conclusions. The example which he set served to awakenthat spirit of profoundand thorough investigation which is not yetextinct in Germany. He would have been peculiarly well fitted togive a truly scientific character to metaphysical studies, had itoccurred to him to prepare the field by a criticism of the organum,that is, of pure reason itself. That he failed to perceive thenecessity of such a procedure must be ascribed to the dogmatic modeof thought which characterized his age, and on this point thephilosophers of his time, as well as of all previous times, havenothing to reproach each other with. Those who reject at once themethod of Wolf, and of the Critique of Pure Reason, can have noother aim but to shake off the fetters of science, to change labourinto sport, certainty into opinion, and philosophy intophilodoxy. In this second edition, I have endeavoured, as far as possible,to remove the difficulties and obscurity which, without fault ofmine perhaps, have given rise to many misconceptions even amongacute thinkers. In the propositions themselves, and in thedemonstrations by which they are supported, as well as in the formand the entire plan of the work, I have found nothing to alter;which must be attributed partly to the long examination to which Ihad subjected the whole before offering it to the public and partlyto the nature of the case. For pure speculative reason is anorganic structure in which there is nothing isolated orindependent, butevery Single part is essential to all the rest; andhence, the slightest imperfection, whether defect or positiveerror, could not fail to betray itself in use. I venture, further,to hope, that this system will maintain the same unalterablecharacter forthe future. I am led to entertain this confidence, notby vanity, but by the evidence which the equality of the resultaffords, when we proceed, first, from the simplest elements up tothe complete whole of pure reason and, and then, backwards from thewhole to each part. We find that the attempt to make the slightestalteration, in any part, leads inevitably to contradictions, notmerely in this system, but in human reason itself. At the sametime, there is still much room for improvement in the exposition ofthe doctrines contained in this work. In the present edition, Ihave endeavoured to remove misapprehensions of the aestheticalpart, especially with regard to the conception of time; to clearaway the obscurity which has been found in the deduction oftheconceptions of the understanding; to supply the supposed want ofsufficient evidence in the demonstration of the principles of thepure understanding; and, lastly, to obviate the misunderstanding ofthe paralogisms which immediately precede the rational psychology.Beyond this point—the end of the second main division of the"Transcendental Dialectic"—I have not extended myalterations,* partly from want of time, and partly because I am notaware that any portion of the remainder has given rise tomisconceptions among intelligent and impartial critics, whom I donot here mention with that praise which is their due, but who willfind that their suggestions have been attended to in the workitself. In attempting to render the exposition of my views asintelligible as possible, I have been compelled to leave out orabridge various passages which were not essential to thecompleteness of the work, but which many readers might consideruseful in other respects, and might be unwilling to miss. Thistrifling loss, which could not be avoidedwithoutswelling the bookbeyond due limits, may be supplied, at the pleasure of the reader,by a comparison with the first edition, and will, I hope, be morethan compensated for by the greater clearness of the exposition asit now stands. I have observed, with pleasure and thankfulness, in the pages ofvarious reviews and treatises, that the spirit of profound andthorough investigation is not extinct in Germany, though it mayhave been overborne and silenced for a time by the fashionable toneof a licence in thinking, which gives itself the airs of genius,and that the difficulties which beset the paths of criticism havenot prevented energetic and acute thinkers from making themselvesmasters of the science of pure reason to which these pathsconduct—a science which is not popular, but scholastic in itscharacter, and which alone can hope for a lasting existence orpossess an abiding value. To these deserving men, who so happilycombine profundity of view with a talent for lucidexposition—a talent whichI myself am not conscious ofpossessing—I leave the task of removing any obscurity whichmay still adhere to the statement of my doctrines. For, in thiscase, the danger is not that of being refuted, but of beingmisunderstood. For my own part, I must henceforward abstain fromcontroversy, although I shall carefully attend to all suggestions,whether from friends or adversaries, which may be of use in thefuture elaboration of the system of this propaedeutic. As, duringthese labours, I have advanced prettyfar in years this month Ireach my sixty-fourth year—it will be necessary for me toeconomize time, if I am to carry out my plan of elaborating themetaphysics of nature as well as of morals, in confirmation of thecorrectness of the principles established in this Critique of PureReason, both speculative and practical; and I must, therefore,leave the task of clearing up the obscurities of the presentwork—inevitable, perhaps, at the outset—as well as, thedefence of the whole, to those deserving men, whohave made mysystem their own. A philosophical system cannot come forward armedat all points like a mathematical treatise, and hence it may bequite possible to take objection to particular passages, while theorganic structure of the system, consideredas a unity, has nodanger to apprehend. But few possess the ability, and still fewerthe inclination, to take a comprehensive view of a new system. Byconfining the view to particular passages, taking these out oftheir connection and comparing them with one another, it is easy topick out apparent contradictions, especially in a work written withany freedom of style. These contradictions place the work in anunfavourable light in the eyes of those who rely on the judgementof others, but are easily reconciled by those who have mastered theidea of the whole. If a theory possesses stability in itself, theaction and reaction which seemed at first to threaten its existenceserve only, in the course of time, to smooth down any superficialroughness or inequality, and—if men of insight, impartiality,and truly popular gifts, turn their attention to it—to secureto it, in a short time, the requisite elegance also. That all our knowledge begins with experience there can be nodoubt. For how is it possible that the faculty of cognition shouldbe awakened into exercise otherwise than by means of objects whichaffect our senses, and partly of themselves producerepresentations, partly rouse our powers of understanding intoactivity, to compare to connect, or to separate these, and so toconvert the raw material of our sensuous impressions into aknowledge of objects, which is called experience? In respect oftime, therefore, no knowledge of ours is antecedent to experience,but begins with it. But, though all our knowledge begins with experience, it by nomeans follows that all arises out of experience. For, on thecontrary, it is quite possible that our empirical knowledge is acompound of that which we receive through impressions, and thatwhich the faculty of cognition supplies from itself (sensuousimpressions giving merely the occasion), an addition which wecannot distinguish from the original element given by sense, tilllong practice has made us attentive to, and skilful in separatingit. It is, therefore, a question which requires closeinvestigation, and not to be answered at first sight, whether thereexists a knowledge altogether independent of experience, and evenof all sensuous impressions? Knowledge of this kind is called apriori, in contradistinction to empirical knowledge, which has itssources a posteriori, that is, in experience. But the expression, "a priori," is not as yet definite enoughadequately to indicate the whole meaning of the question abovestarted. For, in speaking of knowledge which has its sources inexperience, we are wont to say, that this or that may be known apriori, because we do not derive this knowledge immediately fromexperience, but from a general rule, which, however, we have itselfborrowed from experience. Thus, if a man undermined his house, wesay, "he might know a priori that it would have fallen;" that is,he needed not to have waited for the experience that it didactually fall. But still, a priori, he could not know even thismuch. For, that bodies are heavy, and, consequently, that they fallwhen their supports are taken away, must have been known to himpreviously, by means of experience. By the term "knowledge a priori," therefore, we shall in thesequel understand, not such as is independent of this or that kindof experience, but such as is absolutely so of all experience.Opposed to this is empirical knowledge, or that which is possibleonly a posteriori, that is,through experience. Knowledge a prioriis either pure or impure. Pure knowledge a priori is that withwhich no empirical element is mixed up. For example, theproposition, "Every change has a cause," is a proposition a priori,but impure, because change is a conception which can only bederived from experience. II. The Human Intellect, even in an Unphilosophical State, is inPossession of Certain Cognitions "a priori". The question now is as to a criterion, by which we may securelydistinguish a pure froman empirical cognition. Experience no doubtteaches us that this or that object isconstituted in such and sucha manner, but not that it could not possibly exist otherwise. Now,in the first place, if we have a proposition which contains theidea of necessity in its very conception, it is priori. If,moreover, it is not derived from any other proposition, unless fromone equally involving the idea of necessity, it is absolutelypriori. Secondly, an empirical judgement never exhibits strict andabsolute, but only assumed and comparative universality (byinduction); therefore, the most we can say is—so far as wehave hitherto observed, there is no exception to this or that rule.If, on the other hand, a judgement carries with it strict andabsolute universality, that is, admits of no possible exception, itis not derived from experience, but is valid absolutely apriori. Empirical universality is, therefore, only an arbitraryextension of validity, from that which may be predicated of aproposition valid in most cases, to that which is asserted of aproposition which holds good in all; as, for example, in theaffirmation, "All bodies are heavy." When, on the contrary, strictuniversality characterizes a judgement, it necessarily indicatesanother peculiar source of knowledge, namely, a faculty ofcognition a priori. Necessity and strict universality, therefore,are infallible tests for distinguishing pure from empiricalknowledge, and are inseparably connected with each other. But as inthe use of these criteriathe empirical limitation is sometimes moreeasily detected than the contingency of the judgement, or theunlimited universality which we attach to a judgement is often amore convincing proof than its necessity, it may be advisable touse the criteria separately, each being by itself infallible. Now, that in the sphere of human cognition we have judgementswhich are necessary, and in the strictest sense universal,consequently pure a priori, it will be an easy matter to show. Ifwe desire an example from the sciences, we need only take anyproposition in mathematics. If we cast our eyes upon the commonestoperations of the understanding, the proposition, "Every changemust have a cause," will amply serve our purpose. In the lattercase, indeed, the conception of a cause so plainly involves theconception of a necessity of connection with an effect, and of astrict universality of the law, that the very notion of a causewould entirely disappear, were we to derive it, like Hume, from afrequent association ofwhat happens with that which precedes; andthe habit thence originating of connectingrepresentations—the necessity inherent in the judgement beingtherefore merely subjective. Besides, without seeking for suchexamples of principles existing a priori incognition, we mighteasily show that such principles are the indispensable basis of thepossibility of experience itself, and consequently prove theirexistence a priori. For whence could our experience itself acquirecertainty, if all the rules on which it depends were themselvesempirical, and consequently fortuitous? No one, therefore, canadmit the validity of the use of such rules as first principles.But, for the present, we may content ourselves with havingestablished the fact, that we do possess and exercise a faculty ofpure a priori cognition; and, secondly, with having pointed out theproper tests of such cognition, namely, universality andnecessity. Not only in judgements, however, but even in conceptions, is ana priori origin manifest. For example, if we take away by degreesfrom our conceptions of a body all that can be referred to meresensuous experience—colour, hardness or softness, weight,even impenetrability—the body will then vanish; but the spacewhich it occupied still remains, and this it is utterly impossibleto annihilate in thought. Again, if we take away, in likemanner,from our empirical conception of any object, corporeal orincorporeal, all properties which mere experience has taught us toconnect with it, still we cannot think away those through which wecogitate it as substance, or adhering to substance, although ourconception of substance is more determined than that of an object.Compelled, therefore, by that necessity with which the conceptionof substance forces itselfupon us, we must confess that it has itsseat in our faculty of cognition a priori. III. Philosophy stands in need of a Science which shallDetermine the Possibility, Principles, and Extent of HumanKnowledge "a priori"